I've been promising a bag tutorial. Sorry that it's taken me so long. Knitting next time. 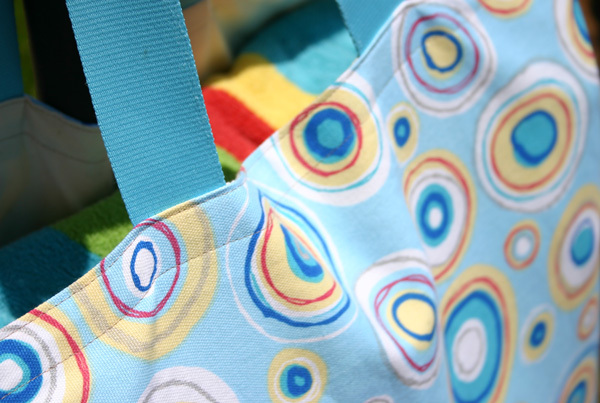 Here are the steps for the most basic of bags. From here modifications are yours to make - have fun. Follow these concepts and you'll be improvising in no time. This all assumes you know how to sew, have basic tools and know how to use them and have made a few things or quilted. If not, I suggest starting with any of the beginners books out right now. 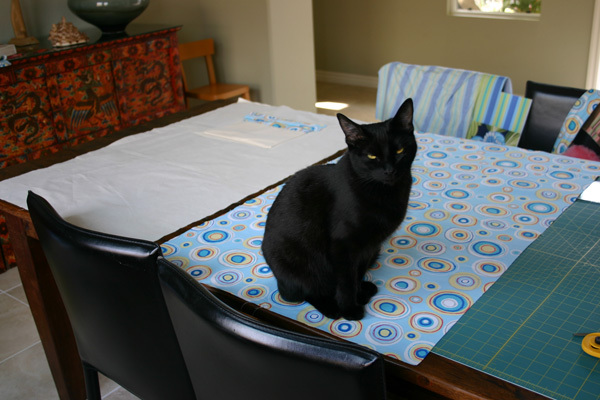 Now is a great time to learn sewing. I made this bag in a morning. The pieces were cut and the pocket made the day before, but the rest was sewn over a few hours with all the typical breaks. It really is an afternoon project. I use these same techniques on my fancier totes, but with more details and fabric piecing. This whole thing cost less than $10, probably closer to $5. Bought the 100% cotton decor fabric at JoAnn's for 50% off. 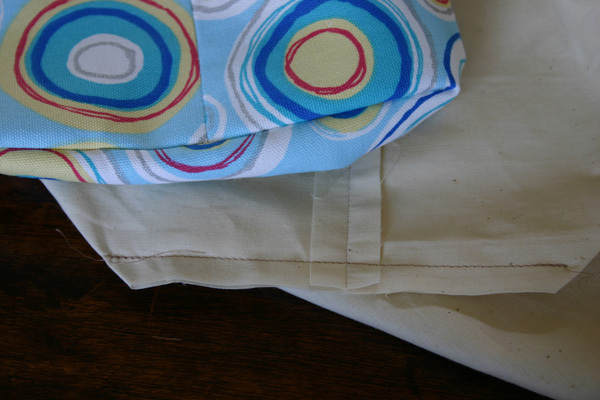 The lightweight natural cotton lining was incredibly inexpensive (less than $2/yd). I used 100% cotton thread in a neutral color and a patch of iron-on stabilizer behind the pocket. A scrap of batting from a quilt project runs inside of the shoulder strap. The web handles were an odd bit from a sale bin at JoAnn's. Finished bag size (all measurements in inches): 18w x 16h x 7d -- This is a big bag. There are four beach towels in the bag in the photos above. For a small bag follow all the instructions below, just change the body dimensions to suit. The long strap is about 2.5 wide and is designed to cross over the body, but it turned out just a touch too long for me (I'm 5'2"). When I get the chance I'll nip it down. Shoulder straps would be shorter. Consider the strap width and style you prefer and run a tape measure over your shoulder and over some bags you have to get a good measurement. 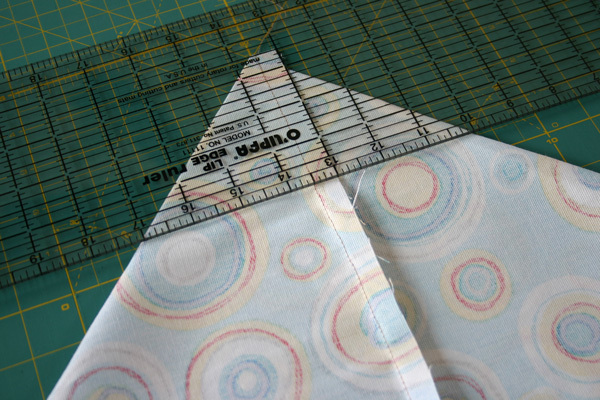 Use a .5" seam allowance for all seams unless otherwise indicated. Note: You can piece the outside however you like as long as the totals always add up. Remember to factor in the seam allowances whenever you make cuts. Don't stress minor mishaps. No one will know if the whole thing is 1/2" less than you planned - just recalculate and move forward. Fold the decor strip in half. Open, fold each edge to the middle crease, then fold in half again (now 2.5 wide). Open the strip and lay the batting along one side of the center crease, then fold as above. Sew close to the edge (a fat 1/8) along the open side first, then turn and sew the same seam width on the opposite edge. Remove the pins and sew two channels down the strap, one on each side of the center. This will keep the strap from crunching and bunching. There are some close up photos of the strap further down. Trim the ends. If making two straps, trim them to exactly the same length. This photo is from another bag, but you get the idea. Sorry, but I'm skipping these instructions. Just make a patch and sew it on. You can see my inside pocket on the lining here. 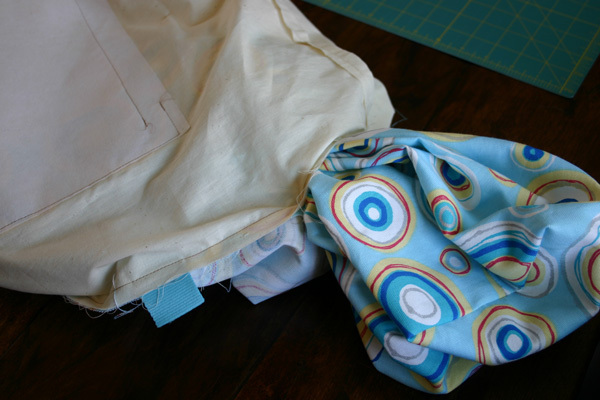 Just be sure that the edges of the pocket will not cross into the bottom or sides of the bag after it's sewn. 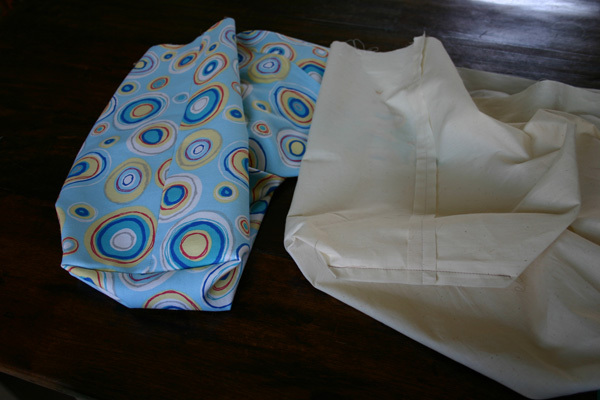 Fold fabric in half, right sides together, to create a 25 x 20 rectangle. 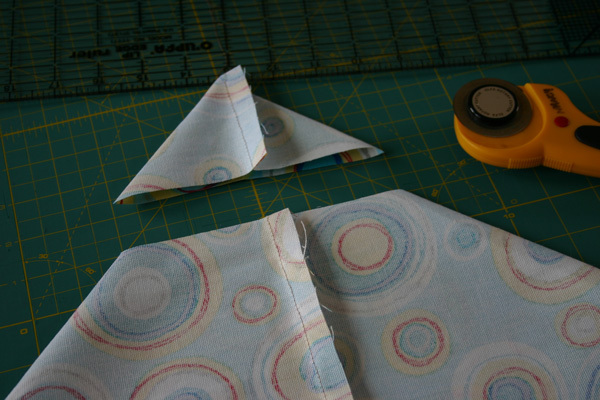 Sew a seam from the fold to the raw edges on each side. 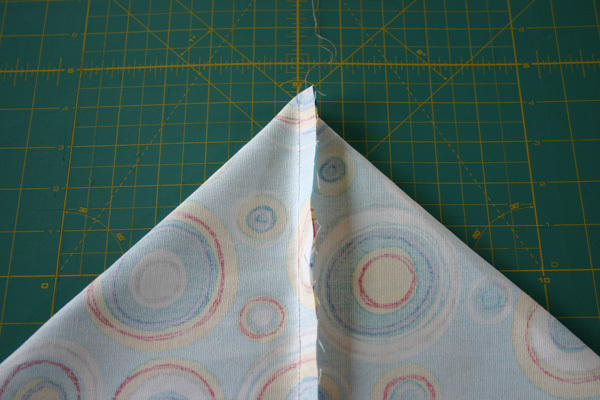 Sewing from the fold allows any variances so push out the ends. 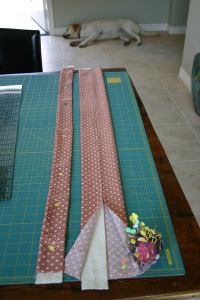 Keeping the pieces inside out, make the corners as follows (see photos below): Create a triangle at each bottom corner with the side seam centered on top. I love my large Olfa mat for this. Cut so that the .5" seam will create the desired bottom width. Check this very carefully before cutting. In this photo I'm measuring the 7" seam. You might want to mark this with a pencil for sewing. Then I moved the ruler .5" up to create the .5'" allowance. Check again before cutting to be sure the side seam is straight on the mat and under the ruler lines and that the triangle edges are aligned. Iron the side seams open and pin if desired. Sew. Repeat on each bottom side of the bag and lining. This is what your pieces should look like at this point. Important Note: I attached the side straps first and regretted that. When using center and side straps, attach the center ones first so the side seams will lie flat as you're trying to find center. I'm showing it here in the order I did it so the photos make sense. Obviously it's possible, but it makes centering the straps much more challenging. Place the strap(s) as desired with about 1" above the raw edge of the bag. 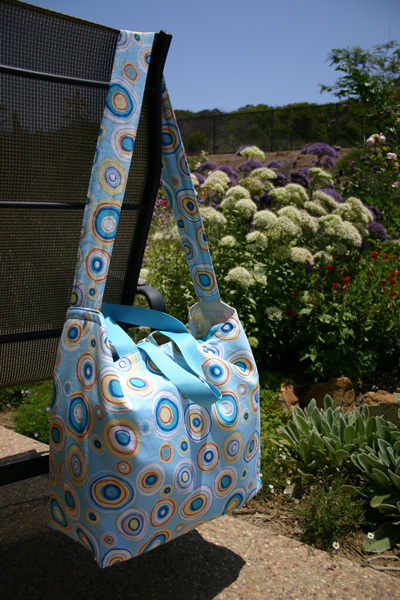 For this bag I'm centering each strap end on a side seams (see photo). Be sure not to twist the strap. Pin and sew only across the width of the strap a touch less than .5" from the top of the body. This is just to anchor the strap to the body for the final steps. Check the placement and test the length (better than I did). 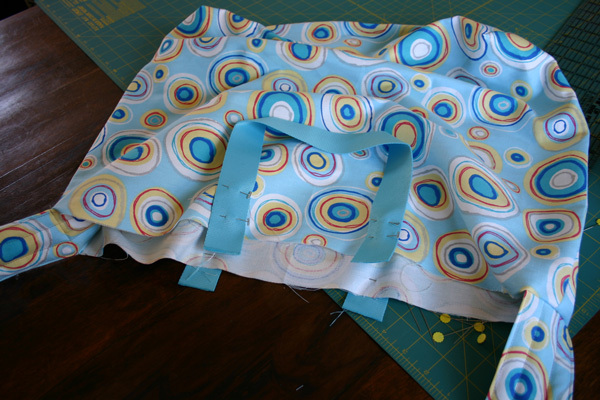 For center handles, find the center of each side of the bag and attach the handles as above. I used webbing for this bag, but if you're making fabric shoulder straps you would attach them this same way. Align the straps very carefully. Check the centering, width between and total length very carefully. Check, pin, check, pin again. Place the lining, still wrong side out, over the bag and pin along the top edges for a .5" seam around the top. The straps should be between the bag and the lining, which are now right sides together. A bit of fiddling is required at this point to get all the seams aligned. Align the side seams and then check the handles again to be sure they're even and going straight down into the bag. The more careful you are at this point, the better your bag will look. Take your time. This is a chance to correct any minor inconsistencies. Sew around the top edges leaving a 4 - 5" opening. I generally leave this opening near a side seam, but not on the seam or a strap. 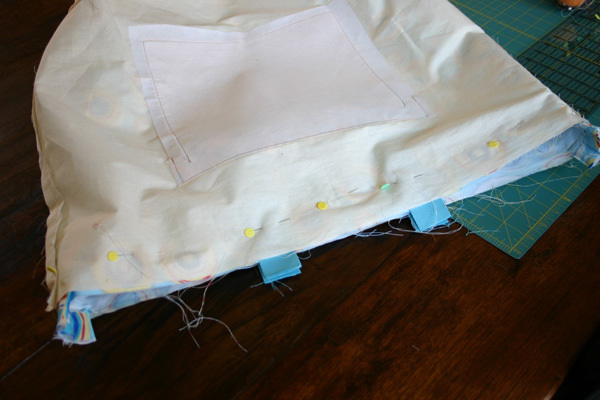 Be sure to back tack at each end because this seam will be stressed in the next step. Reach in the opening and pull the outside of the bag through the opening. Work slowly and try not to stress the top seam. This is a bit fiddly, so don't get frustrated. You'll figure it out as you go in one of those ah-ha moments. As you finish the lining will flip into its proper place inside of the bag. Tuck the raw edges of the opening .5" between the layers even with the seam. Iron all around the top edge and pin if you need. 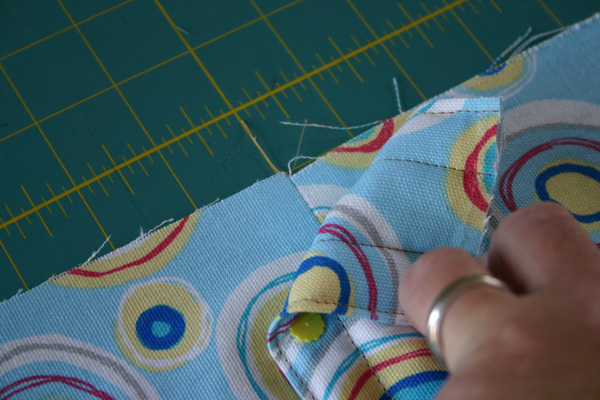 Sew a narrow seam (a fat 1/8") around the entire top, closing the opening. I usually sew a second seam between .5 and 1" down from the top to reinforce the top and capture the strap ends (now between the layers) at a lower point. Congratulations. You've made a bag. PS: When I first published this I used indented bullet points for the instructions. It looked great on the editing screen, but published as centered text. I tried overriding it with left align HTML codes, but it didn't take. It reads OK on Firefox, but not IE. Not worth futzing with so I just removed the codes, but I'm sorry it doesn't read easier. I'm seeing them as centered, Nancy. Your lists are centered with IE6, left-aligned with Firefox. I think it might have to do with your body tag (text-align: center). I'd try adding a tag for the ul to your css (text-align: left). That should do the trick. I like the bag, it's cute. My daughter would love a bag like that for the beach. And I love the fabric, it's one of my favourite shades of blue. The pattern is really well done! Many thanks. I can't wait to get started. All of my son's teachers will get new bags for Christmas! Great tutorial! and I love your fabric! I love the tutorial - the instructions are so clear and calming! I used to sew a lot before Madam became a toddler and screamed whenever I went near her with a lovingly smocked dress. I am feeling inspired to take time off in the next couple of weeks and dig the sewing machine out of the window seat (underneath the hamster cage which is a major moving exercise), now for a tutorial on chossing such pretty fabrics please. BTW, if we make a bag do we get a free kitty with completed item? I love the tutorial. 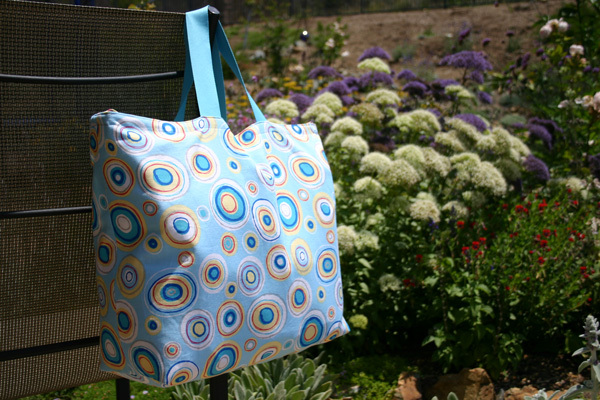 I have been thinking I need to make some bags, and replace some old ones (not made by me) but I keep putting it off. Each time you show another one I am reminded; now I have no excuse. yay! I'm printing this up and am going to try it! Thank you! Great tutorial!!! Thanks ever so much. I think I could get addicted to making bags. hehehe I love the look velvet is giving you, "dude, don't think I'm movin!" Thanks!! I am new to sewing and was looking for another easy project! Nancy, that's absolutely fabulous! Thanks so much! I'll have to give it a whack. I really admire your style of writing the tutorial - it brings out the creative, thinking side of the sewer. I know there are those who need those step by step instructions but give the sewer a little leeway. Wonderful fabric choices here ( and prior post) - you would do a great business on etsy, you would!! Yay! Thank you, Nancy - I can't wait to get started this weekend! Hopefully soon I'll have a pic of my new self-made tote to send you! Yay! Well, I know that I was one of the whiners that begged for a patter/tutorial and this is great, so thank you. I have a question, this fabric appears to be a canvas, do you find it more stable for the larger bags than say, a polished cotton or other nice print by someone like Heather Bailey or or Amy Butler? I wonder if I should go shopping, or use what I have? I really like the fact that you included a shoulder strap AND handles. Very versatile. Great tutorial! You explained it so well, especially to a newbie like me! I'm so inspired to try to make one. Thanks! Just found this...thanks for taking the time to do this tutorial. Very helpful. Oh, and I loved seeing your pets in the pictures. I noticed the dog sleeping in the background of the 1st photo. Then your cat was sitting on the table for the 2nd photo. I was half expecting to see animals in all the pictures! Very neat instructions. Thank you! Thank you! I was looking for a bag to get me through the summer with swim lessons, runs to the neighborhood pool and trips to Vegas and Grandmas. It turned out great and I can't wait to use it. I added an edge of the same fabric to the ends of a cheap beach towel and appliqued my name on it too. I put my initials on the outside of the bag. A little personalization. On the turn out hole I have learned if you make a right turn and sew off the fabric at the opening edges. 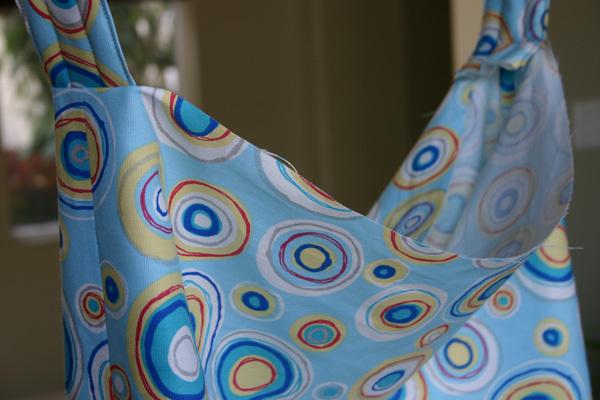 It makes it really easy to turn the fabric back in and sew down. Hello, Thank you for the wonderful tutorial. I am making a bag for my sister based on this. She wanted a bag ot carry all the stuff that goes with traveling with twins....I am almost finished with it. I am relatively new to this tote making scene and am wondering about securing the lining to the outter fabric. other than at the top. is there a way, with just a basic sewing machine, to secure the bottom and the sides? just finished one of these bags and I really like it!! Easy to follow tut and I love the size. It will be great for the beach and pool. Great tote and directions ! Thanks for sharing it with us. I am going to make a neat tick or treat tote using some halloween fabric. I will make it smaller and use two staps. Again Thanks !